Sure, enjoy the Super Bowl. Your tax dollars are paying for it. We need to talk. Have a heart-to-heart. Just us—the American people—and you, our elected representatives. No lobbyists in the room, no satellite uplinks, no “strategists,” either. Seriously, how many of those people do you need? Also, can you stop checking Twitter? And Googling your own name? Thanks. Appreciate that. So: Your relationship with the National Football League. It’s toxic. Not for you, of course. You seem happy, like a bunch of starstruck fans. And we understand—we’re fans, too. Professional football is fun, and no doubt a far better way to spend a Sunday afternoon than rushing around to grovel for cash at half a dozen fundraisers. 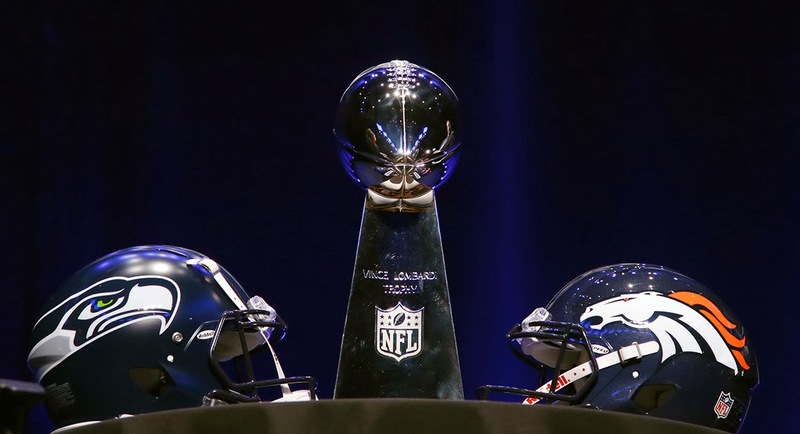 The league throws a terrific Super Bowl party, too, and given the choice, who wouldn’t prefer Denver-Seattle and a tub of guacamole over voting to repeal Obamacare for the 5,000th time? But we digress. Back to the toxic part. While you’re enjoying the epic Richard Sherman vs. Peyton Manning matchup this weekend, the NFL is pulling a fast one on us. Dodging taxes. Pocketing government handouts. Passing the buck on workplace injuries. Mooching harder than one of Ronald Reagan’s welfare queens. Adding insult to injury—come to think it of it, it’s probably the other way around—the league also is peddling a potentially dangerous product to our children with almost no oversight. Oh, and just for good measure, the NFL is spitting in the face of Native Americans as well. You don’t seem to care, though. Not as much as you seemed to care about the size of National Baseball Hall of Fame commemorative coins. But maybe that’s harsh. Some of you—like Sen. Tom Coburn (R-Okla.) and Rep. Linda Sanchez (D-Calif.)—have spoken up about the league’s abuses. Perhaps the rest of you are simply in the dark, and would take swift and decisive action if you understood the full extent of how the NFL is taking advantage of the public, and how you’re instrumental in letting it happen. Can we start with some math? The NFL rakes in more than $9 billion a year, more than the GDP of 53 countries. It plans to reach $25 billion in annual revenue by 2027. Nevertheless, the Internal Revenue Service considers the league’s front office a nonprofit. Just like the United Way or your local chamber of commerce. You know why the IRS is so misguided? Because you gave them the crummy guidance. In 1966, Congress altered the portion of the federal tax code dealing with 501(c)6 business organizations, which are defined as “associations of persons having some common business interest, the purpose of which is to promote such common interest and not to engage in a regular business of a kind ordinarily carried on for profit.” Read that last clause again. Does that sound like the NFL to you? More importantly, Coburn adds, the pro football exemption costs taxpayers millions of dollars a year. And what, exactly, are We the People getting in exchange for our munificence? Better question: What is the NFL getting? In 2012, the league front office—which administers the rules and business for its 32 for-profit teams—donated $2.4 million to charity. Not bad, until you realize that $2.1 million of that went to the Pro Football Hall of Fame. Meanwhile, NFL commissioner Roger Goodell was paid $29.5 million, about 30 times what the chief executive of the United Way made in the same year. Then again, lavish compensation is an NFL tradition. In 2009, the league paid a total of $53.6 million to eight of its top front-office executives; in 2010, league vice president of media Steve Bornstein earned $12.2 million; between 2007 and 2012, ex-commissioner Paul Tagliabue, despite having retired in 2006, was paid $46.4 million by the league office and related organizations. To not work. The league office may be the only place outside of Arthur Laffer’s cocktail napkin where trickle-down economics actually trickle down. Five years ago, the league paid 296 salaries over $100,000. It paid another 135 independent contractors at least $100,000 apiece. It spent about $13.25 million on legal fees and travel. The NFL even dropped nearly $1 million a month for its Park Avenue office space in New York City. This is a nonprofit? 1. The league’s 32 teams pay yearly “dues and assessments” to the league office—about $8 million per team in 2012—which they can then write off. 2. The league office pays no taxes on those dues, which totaled $225 million two years ago. 3. The league loans at least some of the above money back to team owners at below-market interest rates to fund stadium construction, contingent on owners securing public financing for the same stadiums. In essence, NFL welfare is used to incentivize more NFL welfare. And you thought the people who created credit default swaps were evil geniuses. Let’s stick with stadiums. Reuben Fischer-Baum of Deadspin calculates that the total cost to the public for 78 pro sports stadiums built or renovated between 1991 and 2004 was nearly $16 billion—enough to build three Nimitz-class nuclear-powered aircraft carriers, and more than Chrysler received in the auto bailout. Seventeen NFL stadiums were built in that span, accounting for a significant portion of that sum. Citing the work of Harvard University urban planning professor Judith Grant Long, Gregg Easterbrook, author of The King of Sports: Football's Impact on America, estimates that 70 percent of the capital cost of all NFL stadiums has been provided by taxpayers, not league owners. Owners such as Seattle’s Paul Allen, who happens to be one of the richest people on the planet. Again, what did America get in return? Broadcast blackouts, for one. That’s right: Specific federal regulations permit the NFL to have the actual games played in those taxpayer-funded stadiums kept off the air in local markets, the better to force more fans to purchase tickets. Then there’s the dirtiest word in Washington. Debt. Piles of it. Bad debt, too. The kind that neither creates economic growth nor funds public services. Numerous independent studies have shown that the local economic impact of stadium construction is nonexistent, akin to buying a multimillionaire a yacht and then letting him charge you for 10 three-hour cruises every fall. According to economist Dennis Coates, having stadiums and teams in a particular area actually appears to reduce local incomes—a fiscal platform no one running for public office has ever campaigned on. Consider Paul Brown Stadium in Hamilton County, Ohio. Home of the Cincinnati Bengals, the building reportedly cost area taxpayers $454 million, with a total estimated price tag of $550 million once parking garages and other expenses are included. Four years ago, it required a debt payment of $34.6 million—about 17 percent of the county’s total budget—which required local lawmakers to slash spending on schools, police and a program that helped troubled teenagers. Also consider state and local tax breaks: According to Easterbrook, the Seahawks generate roughly $200 million annually but pay Washington state only about $1 million in rent. At MetLife Stadium in New Jersey, home to this year’s Super Bowl, the owners of the New York Giants and Jets pay $6 million a year in local property taxes—well below the $20 million Easterbook says comparable businesses pay. The Dallas Cowboys’ stadium is worth almost a billion dollars; thanks to a clever financing arrangement between the team and the city of Arlington, Texas, the team pays no property tax at all, saving owner Jerry Jones about $17 million a year. Get this: According to the Miami Herald, the NFL tells cities competing to host the Super Bowl that it does not want its employees to have to pay a broad range of taxes: “Income, gross receipt, franchise, payroll, sales, use, admission, or occupancy taxes as a result of holding the Game at the site.” The league also demands rebates on any taxes passed through to the league from local vendors, and to not pay parking costs for Super Bowl events. If you’re Roger Goodell, Free Parking is real. When places like Hamilton County lose money subsidizing the NFL, who ultimately pays the price? The rest of us. After all, people still need schools. And police. Teens remain troubled. Moreover, stadium spending directly impacts the federal government’s bottom line. How so? Congress exempts certain types of local and state bonds from federal income tax, including those that pay for sports stadiums—a statutory carve-out that Bloomberg News estimates costs the Treasury $146 million a year. You know what that same amount could pretty much cover? The annual cost of the Supplemental Nutrition Program for Women, Infants and Children in the state of Pennsylvania. You know, if feeding hungry moms and kids is your thing. Since we’re already discussing children, do you remember Buckyballs? Those tiny magnetic toys? In 2012, the Consumer Product Safety Commission took them off the market, because they can pinch intestines and require surgery when swallowed by children. Federal regulators cited at least 33 swallowing cases that caused injury. Do you know how many concussions youth football produces in a single year? A whole lot more than 33. The Centers for Disease Control and Prevention, which has labeled sports concussions “an epidemic,” reported in 2011 that roughly 122,000 children between the ages of 10 and 19 went to emergency rooms annually for nonfatal brain injuries—and for boys, the top cause was playing football. At least seven high school football players died in 2013, five from brain injuries and two from spine and neck injuries. That doesn’t mean you have to ban youth football. But you might want to hold some hearings and take a good, hard look at what can be done to make it safer. At the very least, you probably ought to review the NFL’s youth football brain safety initiatives, given the league’s: (a) bottom-line desire to turn today’s Pee Wee players into tomorrow’s paying customers; (b) less-than-sterling track record of protecting adult players’ brains. Thing is, you’ve stopped applying oversight, and without that pressure, the league continues to spin and equivocate. The same Guadalajara medical school-trained rheumatologist who headed the NFL’s discredited concussion committee remains a league medical advisor. Last year, Goodell declined to acknowledge a link between football and brain damage. (Indeed, the NFL has admitted the existence of said link exactly once). And while the commissioner and other league surrogates are busy emphasizing the need for more data before drawing any conclusions, the NFL’s youth arm, USA Football, is pushing a safety program called “Heads Up”—which purports to teach safer tackling techniques, even though no data indicates that Heads Up makes football safer. Speaking of brain damage, don’t forget the pending NFL concussion lawsuit settlement. For $765 million—plus another $112 million in lawyer payouts, a total sum that’s still less than the league earns selling the rights to a single season of “Monday Night Football”—the NFL gets to walk away from both thousands of brain-damaged retirees and its own questionable behavior without admitting fault. Nor does the league have to reveal what it knew about concussions and when it knew it—information that could help the public at large quantify football’s risks, and perhaps evaluate whether the NFL should be trusted going forward. Earlier this month, a federal judge refused to give preliminary approval to the agreement. Why? She doubted it was big enough to cover an estimated 20,000 former players, retirees who already have to fight tooth and nail to receive disability benefits and worker’s compensation from a league pension system that according to your own research service long has been rigged against them. Wondering who pays for battered brains and broken bodies when the league doesn’t? We do—and will—via Medicare and higher private insurance premiums. “When these players retire and have dementia and burn through their savings for care—and when the NFL has not done right by them—ultimately they end up with the taxpayers paying for it,” says the honorable Representative Sanchez. “And that is a huge hit to our safety net.” To borrow a popular political meme: Thanks, Goodellcare! By now, one thing should be clear: The NFL is not a private business. Not really. Much like Wall Street’s investment banks, it’s a quasi-public organization that games the system by privatizing profit and socializing risk. A semi-ward of the state. And what other semi-public organization could get away with referring to African-Americans as “Darkskins,” or Asian-Americans as “Yellowskins?” The Washington Redskins are basically doing the same thing. And you’re doing zilch about it, even as you subsidize the team and its parent league. Actually, that’s not entirely fair: Ten members of the Congressional Native American Caucus have urged Goodell and Snyder to change the team’s name. In response, Goodell wrote a letter touting the NFL’s commitment to “diversity and inclusion,” while Snyder told USA Today that he would “never” change the name, and “you can put that in capital letters.” N-E-V-E-R. Ask yourselves: Is that why you came to Capitol Hill? To write strongly-worded suggestions, and then get trash-talked by a guy who has a better chance of winning an Arbor Day award than a Super Bowl? Perhaps you’re afraid to challenge the NFL. That’s understandable. Football is extraordinarily popular—and more to the point, the league office spent $1.5 million on lobbying in 2012, while the NFL’s political action committee and its owners, players and employees collectively donated more than $2 million to Republicans and Democrats alike in the same year. Tagliabue, the former NFL commissioner, works at the powerful Washington firm Covington and Burling; top league lawyer Jeff Pash cut his teeth there; outside NFL tax counsel Jeremy Spector works there; and NFL Players’ Union executive director DeMaurice Smith is a Patton Boggs guy. That’s a This Town lineup worthy of the Pro Bowl. Besides, some high-profile attempts at congressional intervention have flopped: Former Sen. Arlen Specter twice tried to pass legislation that would have made the NFL’s lucrative broadcast rights-selling antitrust exemption conditional on the league not extorting municipalities for stadium financing. He failed both times, then blamed lobbyists. A 1999 Senate bill that would have effectively ended public stadium financing by slapping a 100 percent federal excise tax on all state and local subsidies designed to benefit individual corporations died in committee; eight years later, hearings on the same idea went nowhere. Still, none of that is fatal. Or even reason to be discouraged. You’re Congress. You can write new laws or tweak existing ones, provided you have the will and a bit of patience. Take Senator Coburn. Last year, he introduced the PRO Sports Act, legislation that would tax any professional sports league that brings in at least $10 million annually. Buh-bye, nonprofit NFL. Just this week, he finally found a co-sponsor for his bill, Sen. Angus King (I-Maine)—just as Rep. Jason Chaffetz (R-Utah) introduced a similar bill in the House. Meanwhile, other House members are sponsoring a bill to prevent federal trademarks that disparage Native Americans. And Sen. John McCain is backing legislation that would end the NFL’s blackout policy. On Thursday, a New Orleans Saints fan named Lynda Woolard and a Green Bay Packers shareholder named Ryan Rudominer announced the launch of SackNFLTaxBreaks.org, a grassroots anti-NFL welfare advocacy campaign supported by Senator Coburn—one that grew out of a Change.org online petition to revoke the league’s nonprofit status that currently has 312,000 signatures. A recent Fairleigh Dickinson University poll found that more than two-thirds of Americans oppose public stadium financing and tax breaks for football teams. Eliminating sports welfare for the NFL isn’t a red state issue. Ensuring that children are as a safe as possible and that the public has a clear, non-industry-funded understanding of football’s brain trauma risks isn’t a blue state issue. These are American issues, the People’s business, high-profile opportunities for bipartisan collaboration and achievement in a nation starved for both. Oh, right. You’re checking your BlackBerry. Red states and blue states and the United States and blah blah blah. Fine. We get it. You’re mostly worried about remaining in office. Then remember that you work for us, not Roger Goodell. Back in 2009, Representative Sanchez embarrassed him during your concussion hearings. She’s still in Congress. Meanwhile, former Miami-Dade County Mayor Carlos Alvarez was instrumental in building a new stadium for the Miami Marlins that ultimately will cost taxpayers an estimated $2.5 billion—and subsequently suffered the single worst recall defeat in the history of American elections. Baseball isn’t football, but the lesson is the same. It’s one thing to be a fan, and another to be an enabler. Sooner or later, voters will suss out the difference.